Kumarajiva, (Jiumóluóshi in Chinese), a philosopher and seer, had a long cherished mission: propagation of the true spirit of Buddhism. He broke political, geographical, cultural and linguistic barriers; travelled through barren lands and rivers, mountains and forbidding terrains to bequeath to us a casket of sacred sutras as the most authoritative presentations by translating them from Sanskrit into Chinese. He created pure, boundless and unthinkable versions of the sutras as an obeisance to the sacred voice so that one could bathe in the pure pond of the Dharma. 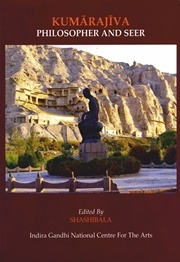 “Kumarajiva: Philosopher and Seer” is a compendium of recent researches on the brilliance that ushers through his legacy, enshrined in thousands of monasteries in China, Korea and Japan, preserving the heritage - his translations of the sacred Sanskrit texts copied over the last sixteen centuries. The life of Kumarajiva was unique in every aspect. His works inspired members of Imperial houses, Emperors, writers and artists, pilgrims and philosophers. His angelic presence can still be felt in the monastic establishments, in the sound of recitation of sutras and in the lives of the people that have been inspired over the centuries by his translations. The researches done by scholars from world academia are included in the present volume on his date of birth, the towns and villages where he spent his life from childhood to nirvana, historically important events of his life, his contemporaries, his contribution to the cultural sphere of East Asia especially defining a new road for Mahayana Buddhism, philosophical theories and vision, comparative studies of his translations and echoes of his translations in Chinese literature.